I forget exactly when it was, but I’d say it was little over a year or so ago when I got a package from Thighbootguy (remember him?) that I hadn’t expected. It was small, so I didn’t expect much, when I opened it, I was surprised to find half a dozen pairs of clip-on earrings. Now, at the time, the only jewelry I wore when out and about on jaunts were necklaces, pendants and a string of pearls for when I dressed up, the idea of earrings were an alien concept to me, especially since I had ZERO intention of piercing my ears. However, I’ll admit to having been intrigued about clip-ons, so I decided to wear a pair on an outing to see what would happen. Right away, I had to admit I liked how they looked on me, while the earrings weren’t fancy, they were cute and made my outfit look fancier, the question would be if I’d be noticed while out and about, and, yeah, that concerned me a little. As it turned out, I had nothing to worry about as no one paid any attention to the baubles on my ears, but then, I suppose I should’ve expected that. I would go on to wear the other pairs and liked how I looked with those as well, the more I wore earrings, the more I came to realize that I didn’t feel fully dressed without them, that quickly became part of my look as a fashion freestyler. It didn’t take long to know that a mere six pairs of earrings weren’t nearly enough, I had to have more, but clip-ons weren’t easy to find, at least not in brick and mortar stores, but online was another story altogether as I found some pretty styles, both in gold plated and silver plated at Sears and ordered nearly a dozen pairs in one sitting: hoops, teardrops, ovals, heck, I even ordered a jewelry case from Amazon to keep everything in. Just like with clothing, shoes and handbags, I went about doing all I could to make sure my earrings matched with my ensemble as they were the last thing I donned after I dressed, after all, it was important to properly accessorize, something I obsess over as looking good is an obsession with me. At present, I have nearly three dozen pairs and yet, I contemplate buying more. Now, are earrings for everyone here on the forum? Certainly not, like with everything else, it’s all about choice and how much of a freestyler you want to be. In my case, earrings are part of my overall image, and I work hard to make that image the very best I can present to the public. And besides, like I said, earrings look good on me, and that’s all the reason I need to wear them. I have worn clip-on earrings handful of times during my life. I've played with the idea of getting my ears pierced as well. Came very close to doing it several years ago, but didn't. I would get them pierced in the spot an acupuncturist would call the eye of the ear. I was also thinking of a tiny ring (or two) at the top of the ear. Due to life-adventures, I needed to get some of my fingernails covered with acrylic, which is then cover with gel for strength. They still looked a little different so I started to get them colored. And I now sport some of the most exquisite nails around. I think my nails have taken the place of any earrings I might have gotten. Maybe one day I will get my ears pierced, but at the present time I'm satisfied with my life and my version of freestyling. Not me. No jewellery at all, not even a watch. Not for me either, but I do have long hair way past my shoulders, been like that since 1970's, but I do wear a watch, maybe on my right wrist, and somepeople think that's weird, and a sign I cannot be trusted, but when my grandparents bought me a watch in the mid fifties, I had a burn on my left wrist and have worn my watch on my right wrist ever since. I've have one ear pierced after about a year and a half and I wear an earring that my wife gave to me. It was hers before so I can say that a "girls" earring is a part of my everyday wear. Clip-ons can be nice but you'll find a lot more styles for pierced ears. Honestly, a small hole in each ear is nothing. If you decide to stop wearing earrings, just take them off and the holes will heal in a very short time. I was wondering when a topic like this might pop up. I was actually contemplating starting it myself. It is definitely for me! My earring collection probably rivals my shoe collection. And my liking for them may have even started before shoes! And like @JeffB My outfit doesn't feel complete without them. Once my passion grew I started experimenting with clipons but found them to be uncomfortable. So years ago I bit the bullet and got mine pierced. And earrings among men are so common these days it's not really an issue anymore. Plus it opens up so many more options and choices earring wise. And it is way more comfortable too! Even before I got mine pierced for the first time I was always intrigued by women and girls who had their ears piered twice. I knew that If I ever got mine done that I would be adding a second set. And that is exactly what I did! And in terms of storage. Here is what I do and it is cheap! 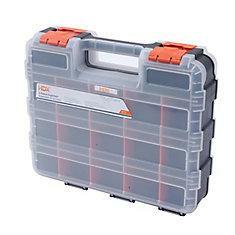 Go to any place like Home Depot and they sell those portlabe plastic storage cases. They have a handle and many small compatments for organizing your nails or any small tool parts like nuts and bolts. They work perfectly for storing and organizing your earring collection. Hope this helps some. I’ve been fascinated with earrings for along as I can remember, starting as a small child and staring at my mom’s and favorite aunt’s earrings - clip or screw back at the time (I’m an OF!) Then, in grade school, reading National Geographic, I learned that in some locations and cultures, men also wore earrings. It was about then that I became aware of the practice of piercing ears, though I didn’t know or understand the details. In my college years, mid 60’s, girls were piercing their ears regularly, but I was a nerdy and heavily loaded (academically) engineering student, so I did not have much of a social life to interact with girls and learn more. Out of college in the early 70’s, a now long-gone girlfriend actually asked if she could pierce my ears. I was delighted with the notion, but my job involved close interaction with the military and I doubted the look would have been accepted, so I declined. But she somehow planted a seed. I’m recently retired, so job considerations are no longer a matter. But my dear wife is definitely not a fan of men with earrings. Were it not for her feelings, I would have mine done in a half a heartbeat. To those of you who do pull off the style, clip ons or pierced - good for you, and I’m a little envious.